I spent a couple of days in Turin –Torino in Italian – for the Salone Internazionale del Libro Torino in the Lingotto Fiere, the imaginatively restored old Fiat car factory. Complete with its test track on the roof. ▲ It’s one of those cities which underlines why we love Italy so much – stylish, tasteful, comfortable, relaxed, what’s not to like. 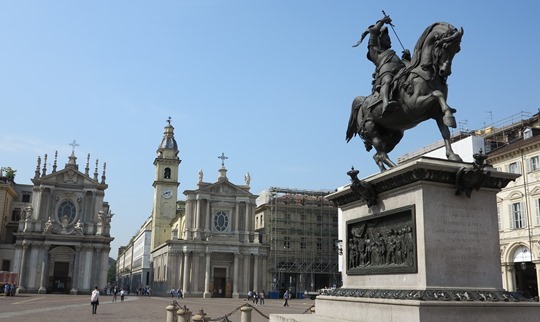 And wonderful vistas like this one of the Chiesa di San Carlo and di Santa Cristina on the Piazza San Carlo, that’s Emanuele Filiberto on his horse in the centre of the square. 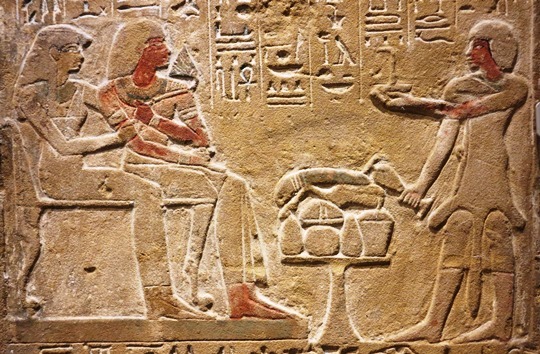 ▲ In the Museo Egizio it’s also got the best Egyptian museum outside of Cairo. The ‘road through Memphis and Thebes passes through Turin’ it has been said. ▲ Plus plenty to see as you wander the streets. I chanced upon Via Andrea Doria, a few years ago I crossed the Atlantic on the Queen Mary II and my Garmin GPS informed me when we passed just 80km from the Titanic’s final resting place. We got even closer to where the Andrea Doria went down. In 1956 about 350km out of New York the Italian cruise ship collided with the Swedish liner Stockholm and went to the bottom. The Stockholm limped into New York carrying most of the survivors from the other ship. In subsequent years the Andrea Doria has been dubbed ‘the Mt Everest of scuba diving.’ Lots of divers have got down to the shipwreck, but lots have died in the attempt. My hotel in Turin had some history as well, it was the wonderfully restored and very comfortable (even if the name was a real mouthful) Hotel NH Collection Torino Piazza Carlina. In an earlier incarnation the fine old building was the Albergo di Virtu, a rooming house for poor youths given a training in a craft or trade. Later it became student accommodation and from 1913 to 1922 Antonio Gramsci was one of its inhabitants. He went on to found the Italian Communist Party, so when his former home was turned in to a five star hotel there were street protests.